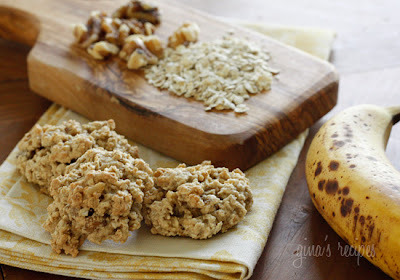 Gina over at Skinny Taste has outdone her self once again.. With these amazing Banana Nut Oatmeal Cookies! The best part is a serving size is two cookies, so you can indulge and not feel guilty at all. Add the egg, followed by the mashed banana and vanilla extract. 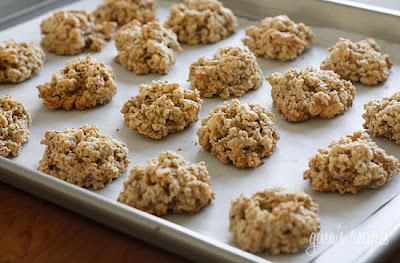 Working by hand, stir in the flour mixture and the oats until just combined and no streaks of flour remain; stir in the chopped walnuts. Drop heaping tablespoonfuls (approx 3 tbsp each) of the dough onto prepared baking sheets. Bake for about 10-12 minutes, or until cookies become light brown at the edges. Makes about 30 cookies roughly 3 tbsp each.